Chairman SEN Soshi at the opening ceremony. 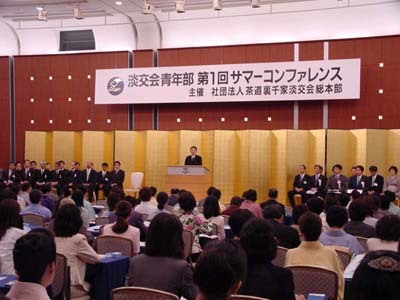 The first ever Urasenke Tankokai Seinenbu Summer Conference, sponsored by the head office of Chado Urasenke Tankokai, Inc. and enjoying an attendance of approximately 530 Tankokai Seinenbu (Youth Division) members, was held from July 19-21, 2002, at the Tokyo Dome Hotel. 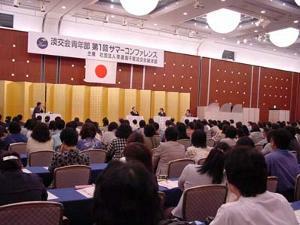 The aim of the Conference was to foster Seinenbu leaders by promoting self-development. 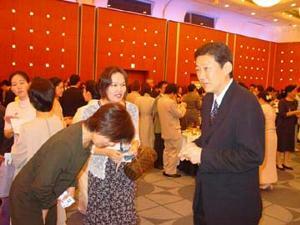 In attendance from the Urasenke head family were Tankokai Chairman SEN Soshi and Vice Chairman IZUMI Soko Masakazu. 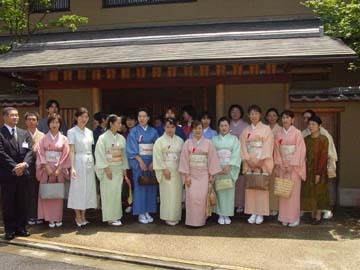 At the opening ceremony, Chairman SEN Soshi explained to the attendees that they were pioneers building the future of the Seinenbu. A congratulatory address was given by Seinenbu advisor NAKASONE Hirofumi (member, House of Councilors; former Minister of Education, Science, and Culture). 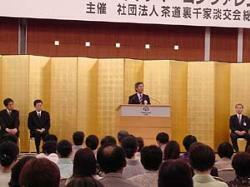 Tokyo Governor ISHIHARA Shintaro gave the keynote address, "Your Pride as a Japanese." Later, there was a name-card exchanging hour, and then the attendees divided into seven "prep session" groups headed by past and current Seinenbu committee chairmen. The central day, the attendees listened to talks and panel discussions, and there was a period for Chairman SEN Soshi to respond to questions submitted in advance. 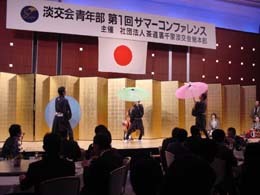 The closing ceremony was from 4:30 P.M., and finally there was a social gathering, attended by about 380 participants, followed by regional after-parties for those who opted. 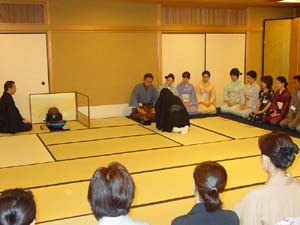 On July 21, the Urasenke Tokyo Branch welcomed registrants to a tour of the facilities and a bowl of tea. 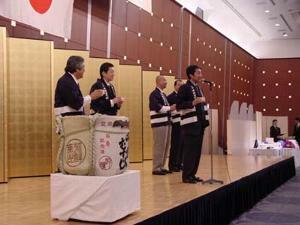 Advisor NAKASONE Hirofumi at the opening ceremony. 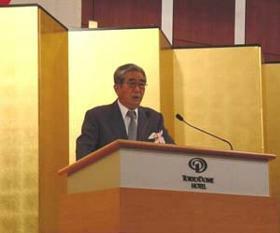 Tokyo Governor ISHIHARA Shintaro delivers keynote address. Chairman SEN Soshi at the name-card exchanging session. 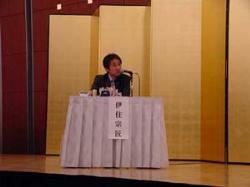 Vice Chairman IZUMI Soko Masakazu chairs a panel discussion on "My Challenge." The panelists are kabuki actor ICHIKAWA Ukon, adventurer TATSUNO Isamu and the heir-to-be in the NAKAMURA Sotetsu family line of lacquer artisans NAKAMURA Kumi. At the Urasenke Tokyo Branch.